As soon as Washington announced its “suspension” of the 1987 Intermediate-Range Nuclear Forces (INF) Treaty beginning on February 2, 2019, Moscow responded by declaring its own “suspension” of the INF (see EDM, January 17, February 4). Legally speaking, neither side is allowed to “suspend” anything; the INF is still officially legally binding for at least six more months as both the US State Department and Moscow have confirmed (Militarynews.ru, February 4). What has in fact happened, as Deputy Foreign Minister Sergei Ryabkov has spelled out, is that both the US and Russia have, practically speaking, simultaneously exchanged notes triggering the six-month waiting period before the INF becomes officially defunct. President Vladimir Putin has ordered his defense and foreign ministries to act reciprocally with the US, so both sides will be abandoning the treaty simultaneously. Putin has also ordered Russian officials not to initiate any new negotiations with the US on any future nuclear arms limitations. Foreign Minister Sergei Lavrov implied Moscow will be awaiting concrete proposals from Washington on a follow-up multinational treaty on intermediate-range missiles involving not only Russia and the US, but China and other countries that President Donald Trump might propose. According to Lavrov, Moscow will not, for the time being, attempt to engage Washington on a possible prolongation of the last remaining US-Russian nuclear weapons treaty: the New START strategic arms limitation treaty, which will expire on February 5, 2021. New START, signed by presidents Barack Obama and Dmitry Medvedev in April 2010, has an inbuilt provision of a one-time five-year extension that does not require a ratification vote in the US Senate or the Russian Duma. Moscow has many times asked Washington to begin talks on this treaty’s prolongation, but, according to Lavrov, Russia has received no response and will not be asking again (Interfax, February 6). The INF controversy has developed into a full-blown propaganda East-West war somewhat reminiscent of the so-called European missile crisis of the late 1970s and 1980s. That late Cold War crisis was, in fact, eventually resolved by the INF Treaty and the elimination of all intermediate-range missiles from US and Soviet inventories. As then, Moscow today is seeking to frighten Europeans by the prospect of them being targeted by Russian intermediate-range missiles because of rash US actions. A strain in transatlantic links may undermine the North Atlantic Treaty Organization (NATO)—long the “Holy Grail” of Russian foreign policy. Moscow has accused Washington of undermining the INF and of preparing to build intermediate-range missiles prohibited by the treaty, while Russia has, purportedly, been attempting to save this arms-control document. As the US announced its “suspension,” Putin convened a televised meeting in the Kremlin with Lavrov and Defense Minister Sergei Shoigu to announce necessary Russian countermeasures. Lavrov accused European NATO countries of following the US’s lead in accusing Russia “without any proof” of violating the INF. Both Putin and Shoigu announced Russia will begin developing long-range cruise and ballistic intermediate-range hypersonic missiles. Russia is preparing to “cheaply” deploy land-based versions of those weapons that have been already developed for sea and air deployment. The Kremlin leader also announced that Russia will not be pulled into a costly arms race with the US and will begin deploying new land-based intermediate-range missiles only after others do so (Kremlin.ru, February 2). Air- and naval-based Kalibr cruise missiles may have already been prepared for land deployment, though the actual production of such missiles will not be “cheap” (see EDM, January 17). Together with the announced “ballistic hypersonic intermediate-range missile,” Shoigu declared Russia’s readiness to field, by 2020, new land-based intermediate-range cruise missiles after the INF is invalid (Militarynews.ru, February 5). This new ballistic hypersonic missile has caused much commotion in Moscow’s expert community: No one fully understands what sort of missile it may be. One proposal is that it could be a reworked Cold War–era SS-20, like those once destroyed under the INF, or maybe a modified and land-deployed “Khinzal” hypersonic aerial missile that is presently deployed in small numbers and fired from MiG-31 interceptor planes. 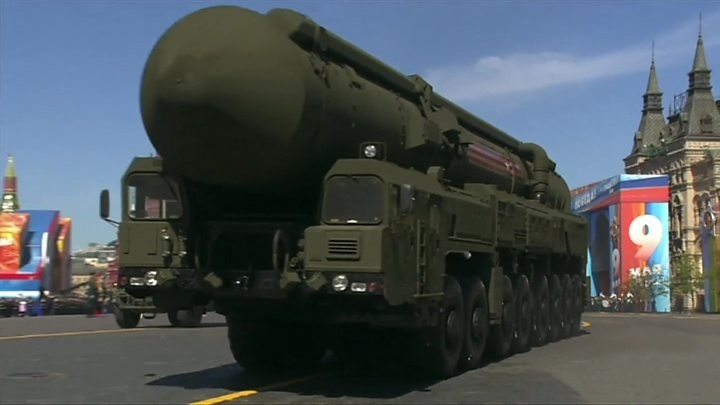 But the Khinzal is, in fact, a modified Iskander 9M723 ballistic nuclear-capable tactical missile that officially has a range of under 500 kilometers (Lenta.ru, February 5). Speaking at a televised meeting in the defense ministry, Shoigu additionally announced the “importance of increasing the range of land-based missiles being developed” (Militarynews.ru, February 5). His remarks, therefore, might suggest that the range of Iskander ballistic missiles, of which many hundreds have already been deployed, could be significantly extended. Or possibly, the 9M729 long-range cruise missile, which Washington says is the primary Russian violation of the INF, is only the tip of the iceberg, and there are other more potent weapons in Putin’s arsenal. The notion of a seemingly “cheap and smart” Russian response to US arms programs is a PR argument directly reminiscent of the Cold War. During the past several years, Moscow has regularly implied it could easily outsmart the “wasteful” Americans who allegedly throw billions of dollars at useless projects with little effect. And most recently, this Cold War–style argument is being complemented by Putin’s mantra about never being pulled into an arms race. In reality, there is no such thing as a cheap nuclear-tipped missile. The present Russian government has been using dubious creative accounting to improve statistical results and declare that the country’s GDP grew by 2.3 percent in 2018 (Kommersant, February 5). But meanwhile, Russian household incomes have continued to fall for a fifth year in a row and are expected to decline further in 2019. Moreover, inflation soared to 5 percent in January, while the drop in consumer confidence has been unrelenting (Kommersant, February 7). The Russian people are paying the price for the accelerating arms race and standoff with the West. But at present, this is not threatening the stability of Putin’s regime, which apparently continues to believe in the saving grace of Cold War–style mobilization of anti-American fervor and defense patriotism.